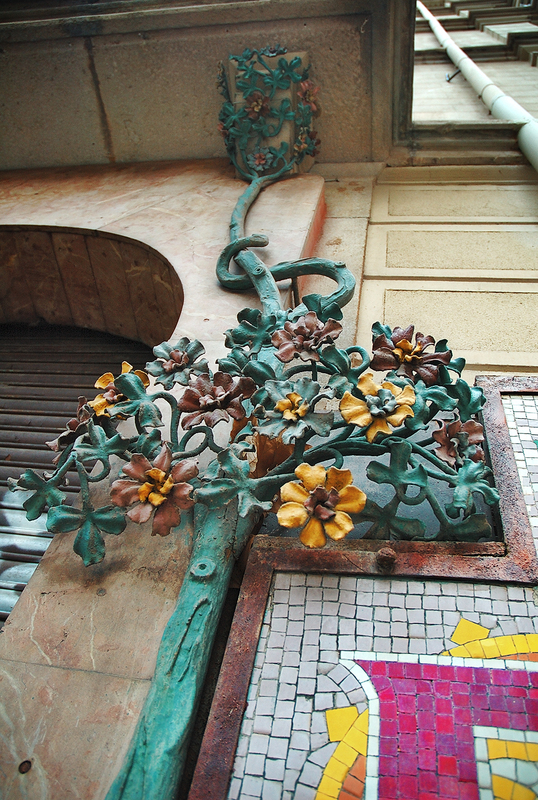 To welcome the new week I would like to share with you this beautiful flower motif found on the façade of the antique modernist Viladot pharmacy and laboratory once featured in this blog and located if I remember well, on the corner of carrer Bruc and Ronda de Sant Pere. One of those small details scattered here and there in the city that you won't find unless you take a walk out of the usual touristic route. Gracias por esta. Una belleza y la toma abierta del post anterior igual. La verdad es no solo salirse de las rutas turisticas pero igualmente tener la capacidad de descubrir (y el ojo) la belleza en estas viejas fachadas y sus detalles. Another lesson in remembering to look up. Thanks. Wow. That's for sure a view one does not see every day. Colours - much needed over here as well. Flowers - natures way to smile. Wishing you a wonderful start into the new week. ¡Hola, Carlos! I love this picture, it's little details like this that make Barcelona a great place to walk. Great pictures! I will add your blog to my blog list if you don't mind. Interesting detail, cleverly shot. Nice one!